It’s not often that we’re treated to a CPU cooler update from AMD, so it was with great interest that we checked out its Wraith in action at last month’s CES. We’ve now been able to poke and prod the cooler over the past week in our lab, and cover everything important about it here. For good measure, we also tackle platform updates. 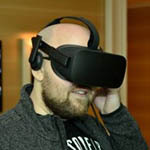 AMD had quite a bit to talk about at last month’s CES, from its upcoming Polaris GPU architecture and APU-infused business notebooks to HDR monitors and platform updates. We talked about most of this during the show, but now, AMD wants to expand on the latter subject: platform updates. As Jamie covered last month, AMD plans to simplify its CPU sockets by the time the next major architecture releases. Today, available chipsets include AM1, AM3+, and FM2+, but in time, all of AMD’s consumer releases will sit underneath the AM4 umbrella, forked between the flagship “Summit Ridge” and mainstream “Bristol Ridge”. 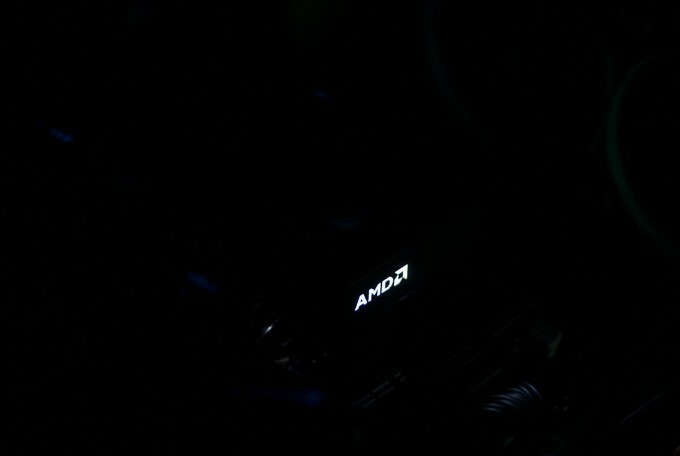 We’re not sure when AM4 is going to launch (we’d assume it’ll be in conjunction with Zen late 2016), but when it does, it could be the first time in quite a while where a current AMD platform actually feels current in comparison to the competition. But because AM4 is a ways off, AMD’s motherboard partners have made sure that some leading-edge features have made it onto AMD motherboards, including USB 3.1 (and USB-C in some cases) and M.2. If you’re looking to upgrade your current AMD platform or want to build a new one, AMD has created the following table to help take some of the pain out of motherboard hunting. Finding an AMD motherboard that offers USB 3.1, USB Type C and an M.2 slot is easier said than done. 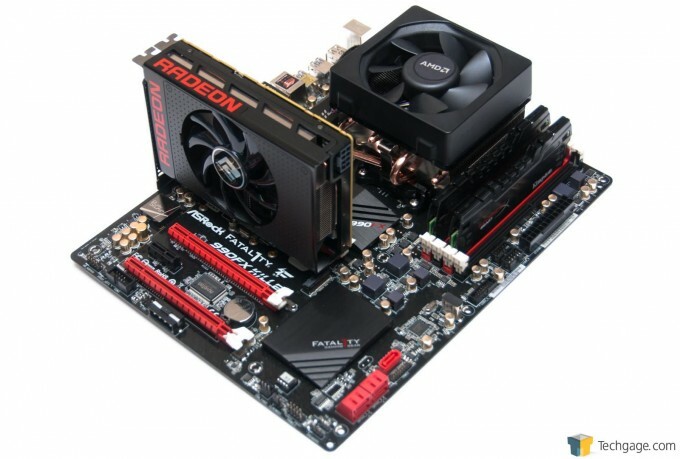 Interestingly, none of three listed MSI boards support anything but USB 3.1, whereas ASRock is the only one to offer an mATX board that has all three features. 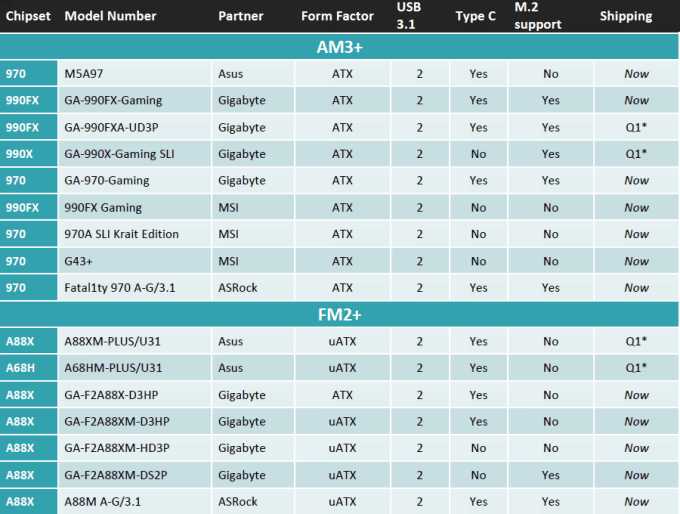 Likewise, GIGABYTE is the only vendor aside from ASRock to have options like that in ATX size, while ASUS takes care of USB 3.1 and USB-C, but passes over M.2. After finding the right motherboard, you’ll need to find the right CPU. Fortunately, AMD’s taken this opportunity to release three new models: A10-7860K, A6-7470K, and Athlon X4 845. The 7860K is an interesting chip; it’s a step up from the 7850K, but loses 100MHz on the base (3.60GHz). 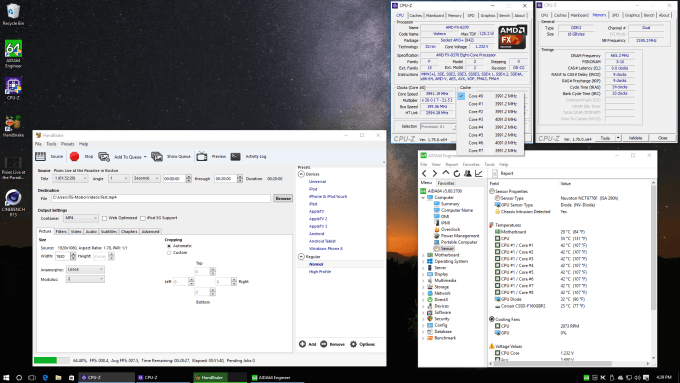 It still peaks at 4GHz, however, and boosts the GPU by 37MHz. Through some sort of miracle, this has enabled AMD to whittle the TDP down to 65W, from 95W. And to keep it cool? None other than AMD’s new 95W cooling solution, of course. Alright, this is getting confusing. Yes, I said “95W cooling solution” when referring to a 65W part, and this is a fact AMD wants to make clear. It knows that it’s giving us more cooler than we need, and while the company didn’t mention it explicitly, that of course is going to aid those who want to push their chip beyond reference speeds (aka: overclock). As seen in the above slide, the new cooling solution AMD is bundling with the A10-7860K and others is a lot beefier than the in-box coolers we’ve come to expect. 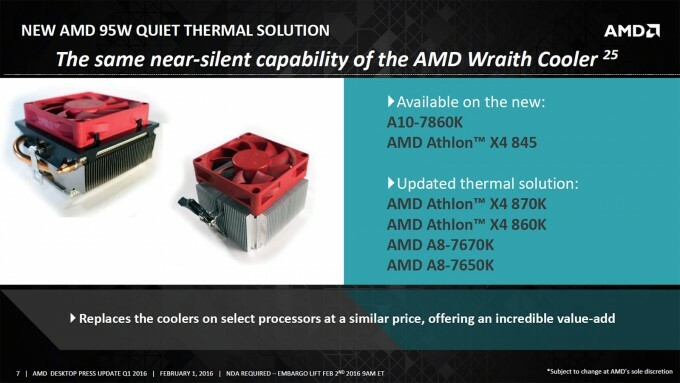 At the top-end, AMD is going to offer its Wraith cooler with the FX 8370; these red-fanned coolers are in effect the same, just without the bling. The fan is also a bit different, bundling 9 blades rather than 7. AMD tells us that noise and temps-wise, both coolers will perform about the same, although I’d wager the red-fanned version would be a bit louder. 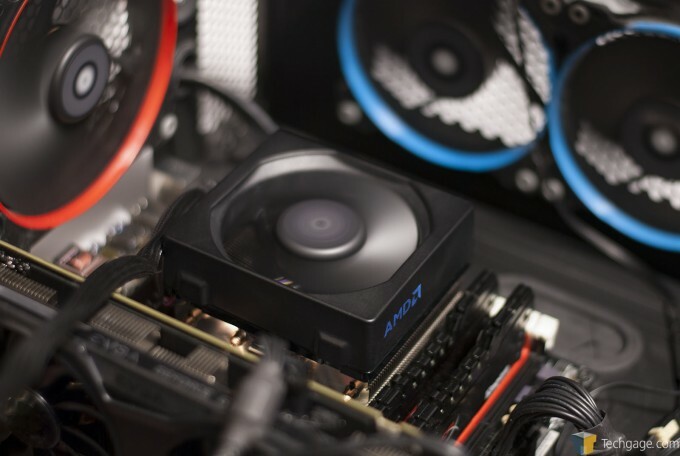 It’s not often when AMD or Intel decide to update the CPU cooler that gets included with their respective processors, and often, when it does happen, they seem to become even smaller and less efficient. AMD has just decided to go in the opposite direction with some of its lineup. At the top-end is the FX 8370 with the “Wraith” cooler. The FX 8370 isn’t a new chip, but AMD has found it to be the ideal match for a cooler of Wraith’s caliber. It’s an eight-core chip clocked at 4.3GHz, and perhaps best of all, it comes in a sweet box (seen below). Flipping the Wraith on its back, we can see that AMD makes use of two heatpipes to run through the fin array twice on each side. The base is a solid copper piece that will make direct contact with the CPU. AMD preapplies thermal material to this base, which I managed to touch by accident in record time. Wraith’s design is quite simple overall, but it’s sharp-looking. Installation is also dead-simple, although the latch common on enthusiast AMD coolers can be a bit finicky at times. So what about performance? Well… here’s the thing: Wraith isn’t supposed to be about improving performance. Instead, AMD’s goal was to give users the same cooling capability with less noise (and more oomph for overclockers). That’s a noble goal, because most people don’t enjoy a loud PC. To give the Wraith a test, I enlisted the help of the Canadian winter to help get temps down to about 22.0°C around the test PC. I then brought the test PC out of sleep mode where I had a desktop prepared for testing. With AIDA64 monitoring temperatures, I used HandBrake to encode a 20 minute segment of a concert Blu-ray into an MP4 using grueling settings (ref=5: bframes=5: b-adapt=2: subq=9: deblock=-2,-2: trellis=2: merange=24). After more than an hour, the FX 8370 didn’t surpass 57°C. You can skim our AIDA64 testing logs, if interested: Full Results (627KB), or Overall Results (7KB). What’s just hilarious about this testing is that afterwards, I realized that the motherboard had pegged the Wraith’s fan at what I’m sure is 100% (~3,000RPM) the entire time. Isn’t it just the funniest thing that ASRock’s motherboard behaves like this by default? Please, someone stop me from laughing! ASRock’s Fatal1ty 990FX Killer has a bit of an odd design, which I am not sure is typical of the company’s newest motherboards. On this one, rather than let people create fan profiles or at least choose a max RPM, users can choose to run fans “Full On” (which is default), or choose between 9 different “levels”. When choosing level 1, the Wraith’s fan ran at 1,700 RPM by the time it got to Windows, and not long into testing, it shot right up to just under 3,000 RPM like it did when set to “Full On”. That’s two full paragraphs about a motherboard, so I’ll TL;DR this: The motherboard I used is not ideal for CPU cooler testing, since it doesn’t start low and ramp up as anyone would expect it to. Thus, all testing was with the Wraith’s fan run at 100%. Bear that in mind. If time wasn’t such an issue, other forced fan speeds would have been looked into. Not going over 57°C is fantastic during a long, arduous workload, but with the fan capped where it was, the PC wasn’t what I’d call silent. After unplugging every fan in the test PC aside from the GPU, Wraith at full-tilt was clearly noticeable. It wasn’t loud to the point of being annoying, but you could certainly single it out. When I set the motherboard’s fan setting to “level 1”, Wraith ran at 1,700 RPM fresh into Windows, which to me was virtually silent even with the PC’s door off. Again, there wasn’t much of a lead-up to that rise from 1,700 to 3,000 RPM, so the fan went loud before long. I feel like if I could have capped the fan to about 2,500 RPM (something I couldn’t figure out with this board’s EFI), I think the cooler would have been much quieter than it was at 3,000 and still perform better than the fan at dead silent. Perhaps even 2,250 RPM would be a great sweet spot, if you don’t mind your CPU edging towards 70°C during a good stress. For what it’s worth, I couldn’t make this CPU get hotter than 67°C. That was with all case fans disabled, room temp at around 24°C, and the door put back on the side of the chassis. For that test I ran OCCT’s Linpack stress-tester for 30 minutes. Ultimately, AMD’s takeaway to you is this: Wraith isn’t meant to perform better on temperatures. It’s meant to cool just as well (or better) than AMD’s other coolers at the same noise-level. It also manages to look elegant, despite having such a ghastly name. We’re in the process of getting Ryan set up with a new cooler testing rig (our last rig’s motherboard died before we could even complete a single cooler review), so soon, this cooler will make its way into his arms. In time, he can show us how it scales in comparison to the competition.